Motherwell have moved closer to being owned by the fans after coming to an agreement about a takeover with retired businessman Les Hutchison. Barbados-based Hutchison is set to buy John Boyle's 70% stake after putting up an interest-free loan to the Scottish Premiership club. Fans group the Well Society will assume control further down the line. Hutchison said: "I look forward to working with the society and the club to achieve fan ownership." "Once Mr Hutchison's loan has been repaid in full, it is anticipated the society will become the owners of the club." It is similar to the deal that took Hearts out of administration in the summer following a loan from Edinburgh businesswoman Ann Budge. Hutchison said his aim was to have Motherwell "financially sustainable within five years". An Argentine consortium had been linked with a rival bid for the club. 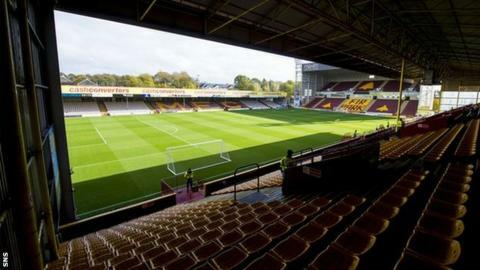 But, should the transaction set out by the "memorandum of understanding" between Motherwell, the Well Society and Hutchison be concluded, the Bothwell-born businessman will provide the club with working capital finance. It will take the form of an interest-free loan, repayable over a maximum period of five years. Ongoing funding support will also be provided by the society, which has just provided another loan totalling £100,000 to the club. Society chairman Brian McCafferty said: "We would like to sincerely thank Les for his generous loan to the club, which has kept alive hopes of community ownership. "We emphatically believe the partnership between Les and the society provides, by far, the best solution to both the club's short-term financial needs and its long-term sustainability and success." A joint statement said the society "has committed to growing both membership numbers and funds in order to demonstrate that the supporter base is fully behind the concept of fan ownership". "Once Mr Hutchison's loan has been repaid in full, it is anticipated the society will become the owners of the club," it added. "Mr Hutchison will effectively act as facilitator for the transition of ownership of the club to supporters, provided there is clear evidence that more of our fan base is willing to support the initiative. "We have now entered a 30-day exclusivity period to enable financial and legal due diligence to be undertaken." The news of the agreement could hasten the announcement of a new team manager. Five candidates remain in the running after former Motherwell boss Terry Butcher withdrew from the shortlist. Caretaker Kenny Black will take charge of the team on Saturday as they host bottom side Ross County. Former Scunthorpe United and Sligo Rovers manager Ian Baraclough, former Motherwell players Mitchell van der Gaag and Rob Maaskant, plus former Kilmarnock manager Kenny Shiels have been interviewed, along with Black.